From seemingly nowhere China has become one of the world’s leading wine producers; from sweet ice wines produced in northern Liaoning province, to cabernet sauvignons cultivated in Ningxia bordering the Gobi desert, or those from the remote foothills of the Himalayas the country is now producing a wide variety of wine in large quantities. Although the Chinese have cultivated wine for thousands of years it is only recently that viniculture has become a major industry and now China is reckoned to be the 5th largest producer in the world. Thousands of new vineyards have been planted across the country to help fill rapidly growing demand. Wine’s recent popularity can partly be traced to its use as a business gift, with French Bordeaux being particularly favoured as a status symbol. These imports increased the profile of wine throughout China which together with the emergence of a newly rich elite and middle class drove the thirst for wine to greater heights. Chinese businessmen soon went from enjoying and collecting wine, to wanting to own the source of product and all the history that comes with it. Chinese millionaires and businessmen have become a frequent sight in the vineyards and chateaus of France as they rush to buy acreage in the world’s most renowned wine growing regions. However the recent government crackdown on gift giving as part of President Xi’s anti-corruption drive saw a big drop in the demand for French Bordeaux and foreign wine overall in 2015. This could in theory help domestic producers who already represent 80% of Chinese wine sales, but do not make much impact in the fine wine end of the market. When it comes to gift giving and investing imports still dominate, the latest trend is for buying sparkling wine such as prosecco, cava and champagne. The potential for growth overall is still huge, as the Chinese populace drinks about 1/10 of the amount US drinkers do (per capita) with most still preferring beer or liquor. Quality has been a major issue for Chinese wine, a decade ago critics were fairly scathing about the country’s produce and even among Chinese drinkers the perception is that imports are superior. However this perception is changing fast as Chinese wine producers have successfully introduced European and Australian wine production techniques and technology to rapidly improve quality, they hope that eventually China will take its place as an established wine region, in the same way the Americans and Australians did in the 20th century. Chinese wines have improved so much in a decade that they are now being exported in large quantities, for research purposes I sampled a Changyu Noble Dragon from my local supermarket. This riesling was flavoursome, peachy, floral wine which went well with fish, but was perhaps a tad too sweet for my taste. European companies have not ignored China’s interest in wine, LVHM, owner of the classic Moet and Chandon brand have invested heavily in China, as have Domaines Barons Rothschild Lafite. Both firms are developing their own Chinese vineyards and tweaking flavours to best serve the Chinese market. For example Chinese consumers generally prefer their wine sweeter compared to westerners. Currently the Great Wall wine is China’s best known product, but whoever can create a lasting quality brand for both the Chinese market and export will have a goldmine on their hands. How can I invest in Chinese wine? Investing in Chinese wine companies like Yantai Changyu Pioneer Wine Company, who are listed on the Shenzhen stock exchange, or the Wei Long Grape Wine Company listed on the Shanghai exchange. Foreigners can directly trade on the Shenzhen and Shanghai exchange although there are important restrictions. There is a good guide on buying in China’s mainland exchanges here. Anyone thinking of investing in Chinese mainland markets should beware that share prices are not always driven by value, but rather government policy. 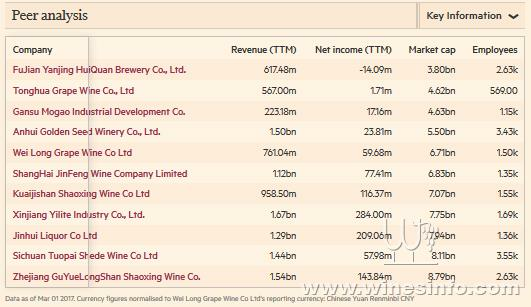 An financial overview of some major Chinese wine producers can be seen below, although some of these firms are more concerned with producing rice wine and liquor than grape wine. Another alternative is to invest in LVHM shares, but remember that their Chinese wine interests are currently only a small part of huge luxury portfolio, of course it could turn out their establishment of Chinese vineyards transform their prospects, but this could take a long time. Perhaps the most accessible and affordable method of getting exposure to Chinese wine is to purchase via a wine trading platform. One of Moet’s Chinese wines Ao’yun 2013 recently went live on Liv-ex (a wine trading platform) valuing it at US$ 1,400 to US$ 1,600 per case. Ao’yun means sacred cloud and originates from the far southern region of Yunnan close to the Tibetan plateau. While this wine may have benefited from novelty value, there can be no doubt that Chinese wine is going to be more investable in years to come. Of course wine is not necessarily a sensible investment in terms of return, but as the saying goes; even if you lose your money at least you can always drink the wine.